Erin Cronin said her approach to teaching calculus is collaborative. Students are encouraged to stay after school to get help from Cronin or Cheryl Szymanski, the other calculus teacher. REVERE — In high school, Robert Stoica stayed after class for calculus help. Now a freshman at the Massachusetts College of Pharmacy and Health Sciences in Boston, Stoica, 18, said classmates turn to him with calculus questions. “I’m at the point where my friends take calculus and I tutor them. I still retain that knowledge from junior year and senior year,” said Stoica, a pharmacy major. What makes Stoica’s calculus proficiency even more impressive is where he honed his skills: Revere High School. 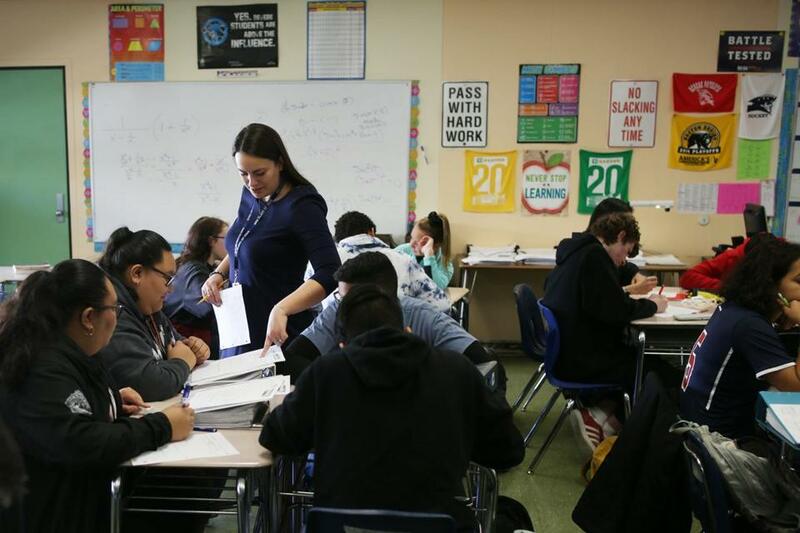 State figures show 62 percent of Revere High students don’t speak English as a first language and 47 percent are economically disadvantaged, but they outperform peers across the state on Advanced Placement calculus tests. “We don’t lower our expectations here,” said Erin Cronin, who taught Stoica calculus in high school. In the last two years, all of Cronin’s students have scored a passing grade of 3 or higher on the AP Calculus AB exam. The highest possible score is 5 and many colleges give credit for grades of 3 or higher. Last May, the Patriots of Hall of Fame presented by Raytheon named Cronin Massachusetts STEM Teacher of the Year. The honor comes with a $5,000 award for Revere High to spend on science, technology, engineering, and math education. Michelle McGlone, education coordinator for the Patriots Hall of Fame, said the selection committee was impressed by Cronin’s accomplishments at a school where many students are low-income and don’t speak English as a first language. Cronin invests a lot of time in her students, staying after school most days until 5 or 6 p.m., McGlone said. Last spring, 82 percent of Revere High students who took the AP Calculus AB exam scored a passing grade, and 94 percent of test takers passed the more advanced AP Calculus BC exam, figures show. Statewide, 63 percent of students passed the AP Calculus AB exam and 86 percent passed the AP Calculus BC exam, the state said. How does Revere do it? Cronin said her approach to teaching calculus is collaborative. Students are encouraged to stay after school to get help from Cronin or Cheryl Szymanski, the other calculus teacher at the school. Cronin and Szymanski, who has been teaching at the school since the early 1990s, said they teach calculus at the same pace so their students can work together on problems and seek help from either teacher. They said they write tests together, administer them on the same days, and use the same grading scale. After each test, students have two weeks to complete mandatory revisions on the problems they answered incorrectly, Cronin said. The revisions give students a chance to master material they didn’t grasp initially and potentially earn up to 10 additional test points, she said. She said she tries to complete the curriculum by mid-March and then prep for the exam in mid-May. Cronin said she emphasizes topics that students struggled with the most, familiarizes them with the test’s structure, and gives them practice taking a timed exam. Noorjahan Mezrouh, a senior who scored a 5 on the exam, said Cronin got her ready. “I felt like I knew the topics well enough to complete the exam,” she said. Cronin knows what it’s like to be a high-school calculus student. She took the course she now teaches at Saugus High School, where she graduated as valedictorian of her class. Her next stop was Harvard University, where she majored in mathematics. She began her teaching career at a private school, earned a master’s degree at Boston University, and started at Revere High in 2012. Lourenço Garcia, executive director of data and accountability for Revere Public Schools, said Cronin is “constantly reinventing” in the classroom. Patrick Adolphus, a Harvard freshman who graduated from Revere High as valedictorian, said Cronin prepped him for college by encouraging him to take advantage of professors’ office hours and not be ashamed to ask for help. “She was like, ‘Oh get over yourself. Just go. It helps.’ ” said Adolphus, a pre-med student. Another Revere High graduate, Ronaldo Marcelino Jr., said he struggled at first on practice AP calculus exams in Cronin’s class, but ultimately scored a 4 out of 5 on the test. Now a freshman studying civil engineering at Wentworth Institute of Technology in Boston, Marcelino said, like Stoica, he now helps classmates with their calculus problems.